Amazon has updated its Appstore for Android app with a feature that will allow users to try out applications on their smartphone, instantly via the cloud, before parting with their hard earned cash to purchase them. The feature is called “Test Drive” and has been available on the desktop for a while, but now it’s rolling out on ‘select’ mobile devices so you can try apps on the spot, on the go. Not every Android phone will be able to take part in the Test Drive program quite yet and neither will every app in Amazon’s catalog. According to Amazon, over 5,000 apps that use basic touchscreen features and device accelerometers have Test Drive enabled. Apps that require multitouch, a keyboard, microphone, camera, gyroscope, NFC, or GPS are not yet available. Amazon also did not elaborate on which phones are compatible with the new Test Drive feature. 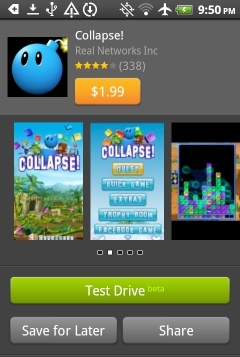 If your phone is compatible, you should see a green “Test Drive” button will appear on an app’s product page, as shown in the image to the right. Once this button is pressed, an instance of the app will start running on Amazon’s EC2 servers, with user input being sent to the server and the resulting video and audio output sent back to the handset. The on-app version of Test Drive is a “beta feature” included with the 2.6.53 release of Amazon’s Appstore app. Compatibility with more Android devices will roll out gradually over the coming months.